Have you ever seen someone make creative notes at a conference and wished that your own notebook was more presentable? It’s probably much easier to do than you think. You don’t have to be an aspiring lettering artist, and you don’t need to develop top-notch drawing skills. Making your notes more interesting doesn’t have to be a huge undertaking. It’s not like learning to play the piano or taking up diving. 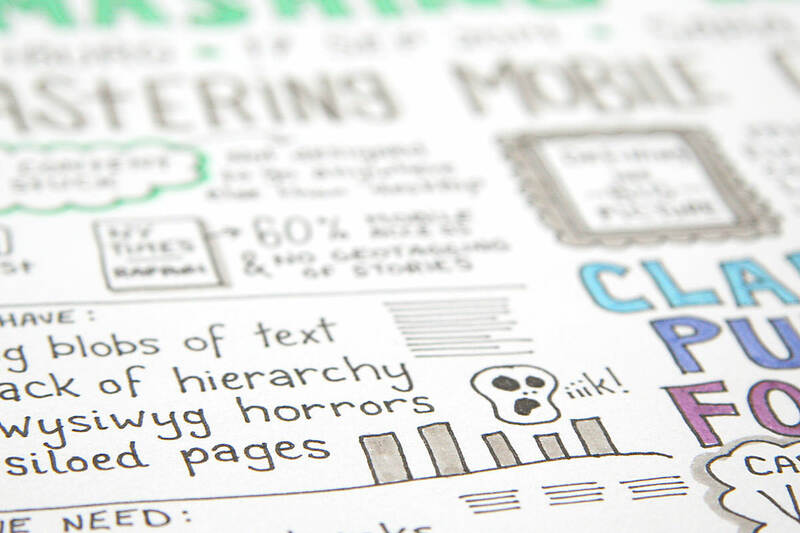 If you think sketchnoting looks fun, I have some tips to get you started. People make all sorts of visual notes. There’s an army of sketchnoters out there, and everyone has their own style. Some do amazing sketches and lavish letters. Some translate complicated concepts into easy-to-grasp diagrams. But for the sake of this article, let’s keep it simple. 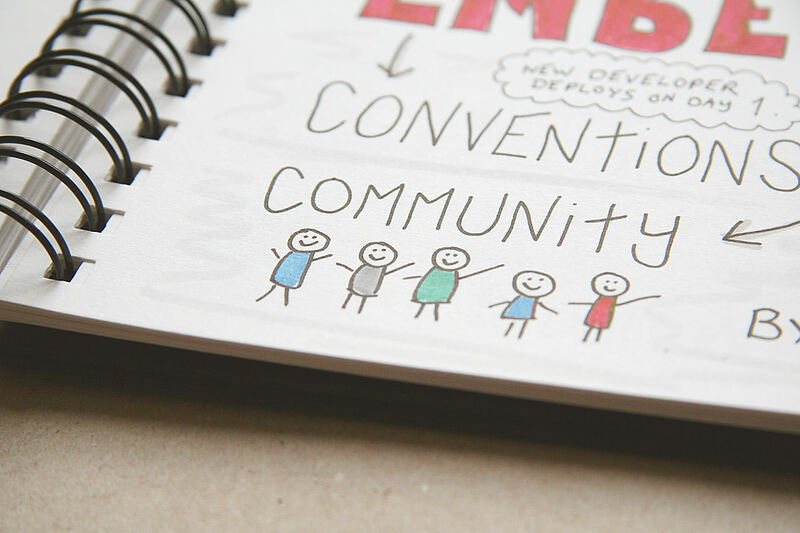 It doesn’t matter whether you call it sketchnoting or doodling or scribbling or simply “adding some joy” to your notes. Just aim for something visual that takes your notes to the next level. Combine this with an effort to slow down when forming letters, and I’ll bet you will surprise yourself at the difference it makes. The goal is to create something that you would want to take out again and look at — and, hey, perhaps even show others. Sketchnotes done live over 45 minutes can’t capture everything. They won’t be a perfect structured summary. My notes are not intended to stand on their own feet. They have value for me and perhaps other attendees at the conference. Make the notes for yourself first. Share them if you want — other attendees will probably love to take a look. 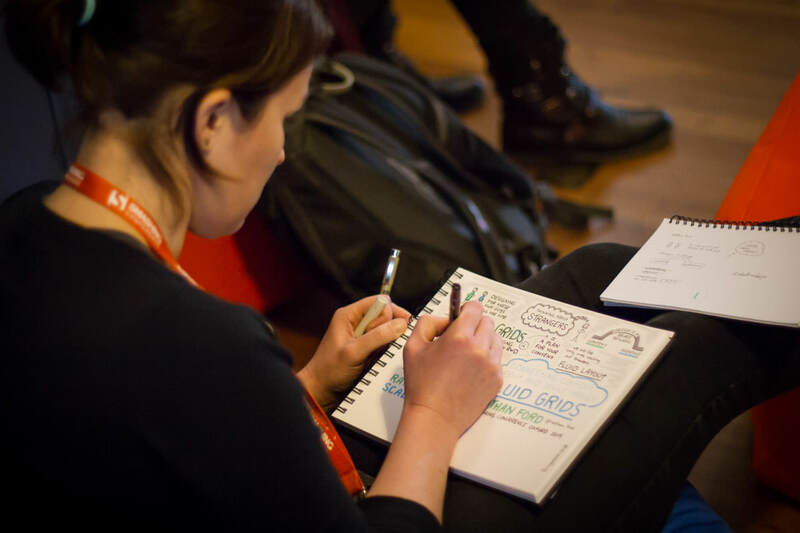 Sketchnotes can spread the word to the outside world about an interesting talk or about the conference itself. 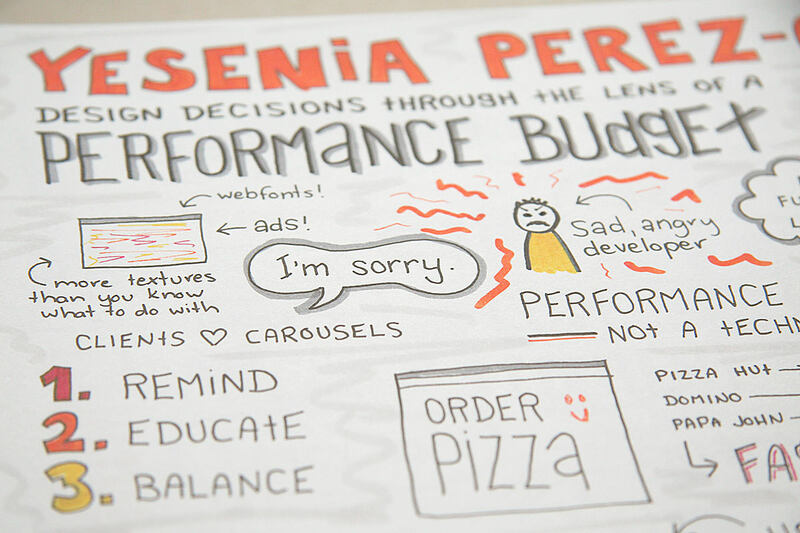 But people who have not heard the talk can’t expect the sketchnotes to carry much meaning on their own. I mention this because people sometimes misunderstand their purpose. Keeping this in mind will help you get started on your own sketchnotes. You don’t have to try to “instantly” explain everything or worry that you’ll miss one of the speaker’s key points. It’s OK — they’re just your personal notes. Your notes might not make much sense to people who haven’t heard the talk, but that’s fine! So, why bother with any of this? Because the act of writing stuff down helps you to remember. This is a basic study technique. The sound bites you capture from a talk will jog your memory when you flip through the notes later. By drawing something to create connections, you will increase your ability to remember. 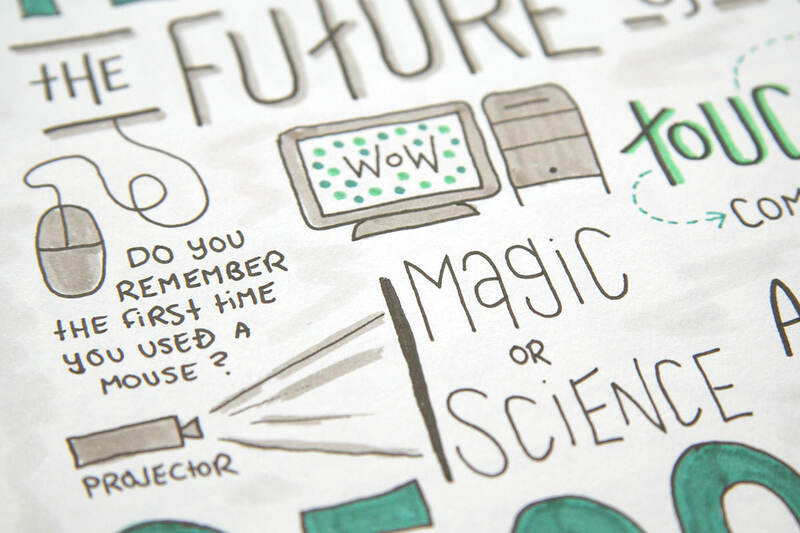 Notes that combine words with sketches are more useful than text alone. Chances are you don’t even hang onto boring old regular notes anyway. Making something you will look at later might be the most helpful benefit. But all in all, you could do worse than to have “fun” be your main reason for taking sketchnotes. When the primary purpose is fun, you’ll let yourself play around. Write something silly, draw objects that talk, and in general don’t be so serious. I reckon fun is reason enough. Oh, all those WYSIWYG horrors! We all know that it’s not about the tools, but so many wonderful pens are out there, waiting for you to try them. You can find a lot of motivation in a set of shiny new pens that have perfect nibs and a long way to go before drying out. I hereby grant you permission to go nuts in the pen aisle. You have had plenty of ballpoint and rollerball pens, but have you tried a fineliner? Its tip is made of fiber or plastic, like on a marker, and it comes in a variety of widths and colors. Any brand is fine. My handwriting looks a lot more neat with a fineliner than with any type of ball tip. This might not be the case for your style and scale of letters. Try! Start off with two black fineliners and a light-gray marker for shading. You can start by getting two different widths of black fineliners to create contrasting lines. (I’ve been using 0.4 together with 1.0 a lot lately.) You will also want to get tools for coloring and shading. 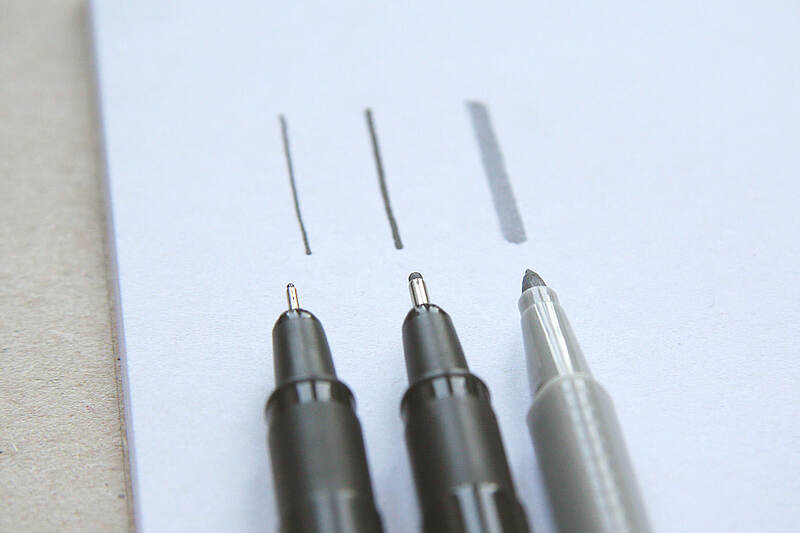 You can add shadow with a light-gray marker, which does wonders for elevating your doodles. A handful of different hues are enough to add a splash of color. The daring may want to venture outside the primaries and secondaries of the basic color wheel. Look for color names like salmon, asparagus and raspberry for a more elegant touch than your basic red and blue. Choose the paper that will inspire you the most or — if more relevant — scare you the least. 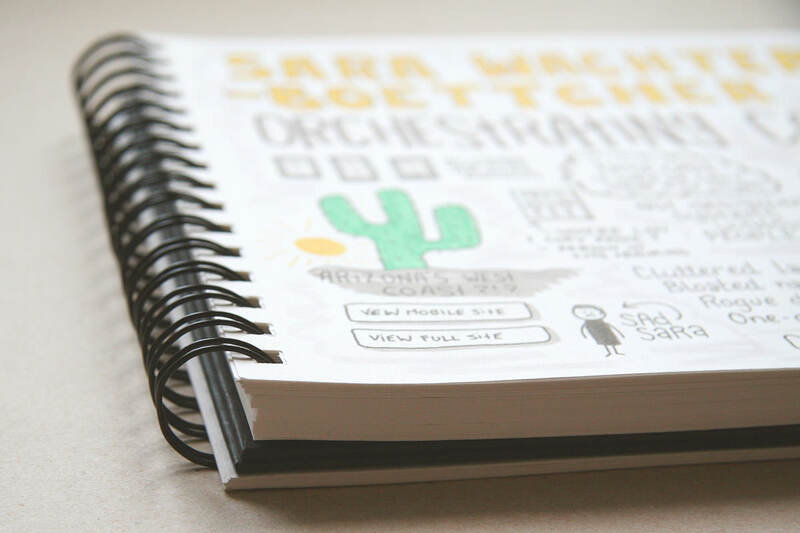 Do you like the idea of starting a new notebook and filling it with sketchnotes? Then go find a nice big expensive one to start your collection. My favorite at the moment is a spiral-bound notebook with a format somewhere around landscape A4. These sketchbooks are a pain to haul around, but I like the large pages of thick paper and how it folds to lie flat on my lap. 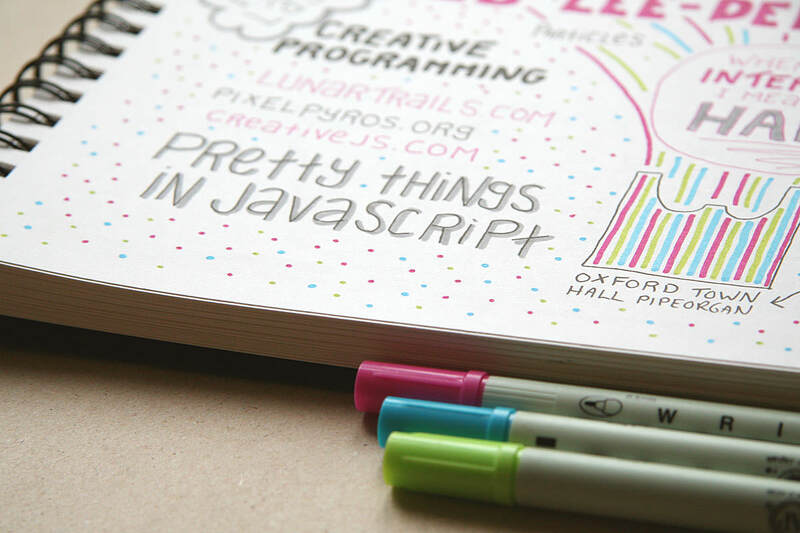 A spiral-bound notebook gives you one large clean page to work on. the back of something you found in your swag bag. Remembering something that was said while continuing to listen as you’re spelling and sketching is impossible. My trick is to draft notes in another notebook and to snap photos of certain slides. It sounds like extra work, but this is the only thing that works for me. My brain can’t perform all of those tasks at the same time; I have to switch between them. By jotting some words on the side, I can zip back to sketching what I was working on. Lettering something already written down elsewhere makes it easier to keep listening because I’m just drawing one letter at the time. When I get stuck for content, I refresh my memory by checking Twitter to see what other attendees have commented on. You can always count on finding the funniest quote of a talk via the conference’s hashtag. People often ask me how I plan a layout without knowing the structure of the talk. The truth is that I almost always either run out of space too soon or have trouble filling the page. Some speakers list the topics they’ll cover. Pay close attention if they do: This is a sketchnoter’s gold. A lot of times, though, you can’t plan much of anything — you just have to wing it. The layout can be a puzzle, but you decide how big the various pieces will be. If you’re sketchnoting live, you really only have the scheduled duration of the talk to go by. Has the speaker reached about the halfway point at the same time that you have? Also, save space for any excellent closing points. If you end up with too much empty space, go ahead and put something huge in the bottom-right, or draw a sun. I tend to cram too much onto the page and should remember that white space is not the enemy either. Want to publish your notes as soon as they’re done? 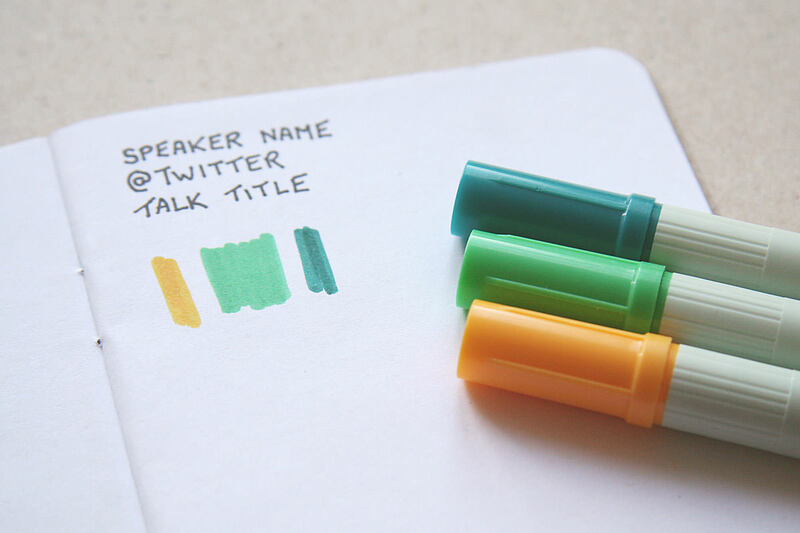 Prepare a list on your phone with the speaker’s Twitter handle and talk title. Rather than searching for the correct spellings for your tweet, you could spend this saved time on your notes or taking a coffee break. Certain details you absolutely want to get correct. A cheat sheet could save precious time during a busy conference schedule. Another problem for me was wasting precious time pondering which colors to use. The finished product often ended up looking less than harmonious, too. So, before the Smashing Conference in Freiburg, I planned a color scheme. I picked a series of nine matching colors, one key color for each talk, with touches of the previous and next colors as accents. Just going through the colors in order during the two days made things easier. Sketchnoting is excellent training to combat those pesky perfectionist tendencies. I know you’ve got plenty of them, and I know how detrimental they can be. I used to suffer from illusions that I could go home and “finish the notes later.” This never happened. Ever. Now I photograph my notebook right there on the floor of the venue, and that’s it. No completing tomorrow, no fixing spelling mistakes, no retouching when I get home. Tweeting your notes right away is very much optional but highly recommended! For me, deciding that the page was done there and then made all the difference. 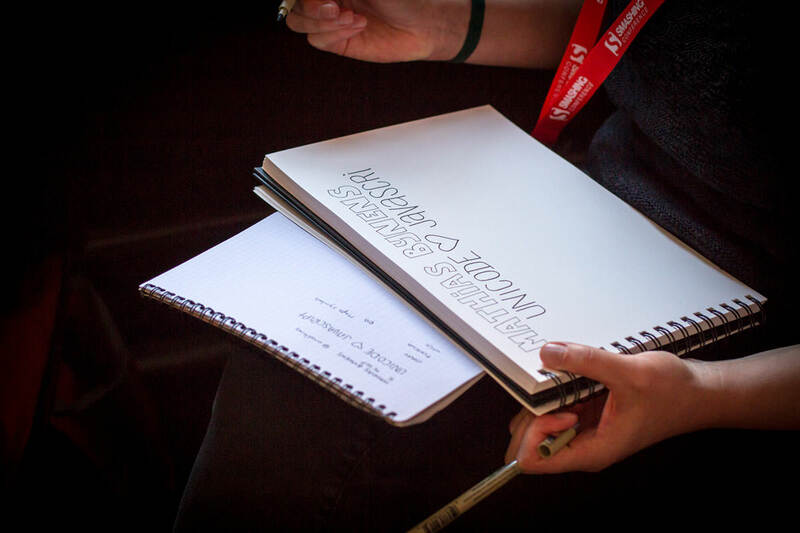 There is no right or wrong way to take sketchnotes at a conference, and you should absolutely make your own rules. Some people like to get a head start with an elaborate title or a caricature of the speaker. Some people scan their notes later and color them digitally. You don’t have to cover the entire talk either. Snippets are excellent and give you much more freedom. Figure out what works for you, change the rules as you go, and give yourself some sort of a deadline. Anyone can draw a community! Sure you can. You can draw arrows, smileys, stick people, browser windows, mobile phones, boxes, stars and clouds. Practice at your desk with an online talk first, and I’ll bet the result will be a lot better than you expect. Now, go get yourself some new pens! Other people are technically better than us in a whole range of things. Don’t let that get in your way. We could look at a master writing calligraphy and feel we are not worthy of even holding a pen. Sketchnoting should be like running, cooking and photography. It’s for anyone and everyone who wants to try, have fun and improve as they go along. Whiteboard warriors Kate Rutter and Molly Clare Wilson share their top picks to keep you learning and drawing. Eva-Lotta Lamm has collected a list of books about sketching and visual thinking. She has also written a lovely blog post about her favourite pens for sketching.